Mike Matchett: Hi. I'm Mike Matchett with Small World Big Data. And we're going to talk about object storage: one of my favorite topics and particularly one of my favorite storage topics. Object storage lets you access large blobs of information and really get at them with simple protocols. GET, PUT and things like that. Usually scales to millions, sometimes billions, or even larger amounts of objects when we're talking object storage. And object Storage has metadata that you can leverage for all sorts of really cool things: governance and the analytics and some really smart driven policies and other things we'll talk to. Today I have Cloudian, I have John Toor who's the CMO of Cloudian. Welcome John. I want to talk about object storage but not just any object storage, we're going to to talk about enterprise object storage. This is where Cloudian really enters the market, right? This is your focus, is bringing object storage to enterprises in particular enterprise data centers. Jon Toor: Yep that's exactly what we do. So Cloudian has been around since about 2012, shipping and the object storage marketplace. But as you say really specializing in enterprise object storage and we're well over 300 customers today worldwide. We shipping to almost every continent except for Antarctica I think and really deployed in a wide range of use cases. I think you and I have talked before, you pointed out backup and archive are traditionally used as cases for object storage because it is a great repository for those things. However it's finding it's way into a wide variety of enterprise use cases that make it something that is becoming mainstream in today's enterprise data center. MM: So what does it take for object storage to be enterprise capable? We've had object storage for five, ten, maybe even more years in certain ways and people have played with it down with everyone knows about Amazon S3. What is it take for an object store to really be an enterprise quality solution? JT: Yeah. So when people look at our big storage today they're expecting the same kinds of things they would get out of any enterprise sand or NAS storage solution. So they want ease of use now. They want a purchasing model where they get all in one. So it's an appliance. Everything is the hardware and software are shipped integrated. They want something that's fully supported, 24 by 7 support across every time zone and they want to have that handholding that they know that they can get the professional services, the installation, the training, the customer configuration if required, all of that that they would normally expect from any enterprise storage solution they today expect from their object storage solution as well. Yeah. And we haven't even really gotten into all the advanced features that just have to be there you have to have replication, you have to have scalability, you have to have protection, you have to have clustering that actually works when a node fails, you were telling me before. The clouding does that in spades. So who's operating this storage in an enterprise when object storage comes in. Is it Web guys that wanted object storage? Is that your data protection folks trying to replace their d do back ends? Who's really running object storage at this enterprise level? Who in IT Can Run Object Storage? JT: And that's exactly it Mike, is that today object storage is run by the same individual who is running every other type of storage in their environment, whether it be data protection whether it be SAN or NAS or in some cases a business unit owner who owns the data itself. So object storage can be run by anyone in the enterprise. 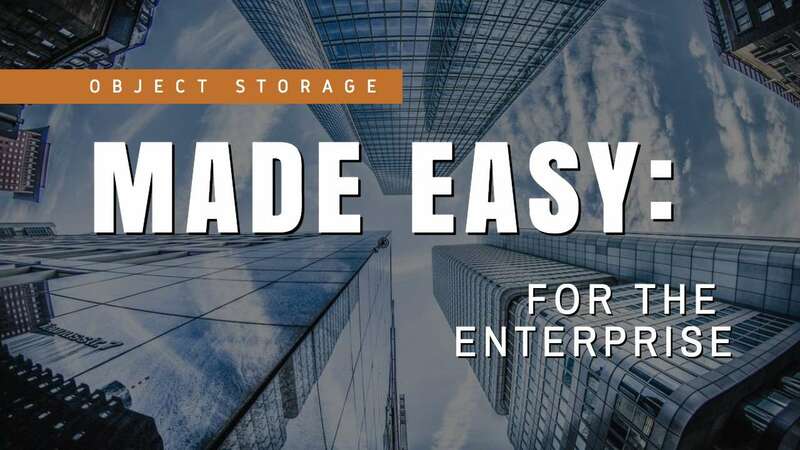 And that's really where today's object storage gets in, because it is easy to use, it is fully supported and it is highly robust. So it's got to be something that anybody in your organization who's I.T. savvy can pick up and run and I think that's really what makes object storage today stand alongside SAN and NAS as the new generation of storage that can be deployed anywhere you need to store a lot of data. MM: So I got to ask you this question. I know we talked about it a little bit off line but I'm sure people watching this want to know why I'd want to be buying more enterprise storage in a time where everything should be going to the cloud. And when I think of cloud I think of cloud object storage. So what's been happening that I want to bring cloud object storage on prem, and why is it growing? Why is it such a growing market for you guys? JT: Yeah. It's really interesting because if you look at some recent data from IDC they asked I.T. managers about their ideal cloud scenario. In other words if you were to visualize your perfect cloud scenario what would that consist of? Well it turned out 80 percent of the scenarios involve some mix of storage environments. In other words they're asking about cloud that only 20 percent, or just what you and I think of as being just pure play public cloud. The other 80 percent was always some mix of private cloud, hosted and private cloud, plus public cloud. You know some variation of mix of environments. And the reason for that is that you can do things with storage on prem or storage in a colo. That you just can't do with public cloud. And the reality is data, you know the phenomenon of data gravity? That's just a fancy way of data tends to remain where it's created. If you're creating a large amount of data, that data tends to reside close to where it's created and that point of creation could well be in a lab, it could well be in a video production facility, it could be in a site where you're collecting a lot of video surveillance information which maybe a hotel, casino or something like that. It could be a manufacturing facility where a lot of data is being generated on the factory floor. Wherever that data is coming from. JT: t's going to tend to want to reside there, and that doesn't mean you don't need cloud, you absolutely do because you may be running applications in the cloud, or you may be storing some kind of analytics in the cloud. But that bulk of data that's coming out of that video production or that same genomic research, and just as an example, in whi h being created in the lab will often tend to risk dying close to where that data is being created. And that's what people are looking at, is I need to have storage in different places for different things and they all need to work together. So the world is evolving from one where people thought of public cloud as kind of the be all and end all, to a different kind of world where the public cloud is another form of compute environment that resides alongside your coat or resides alongside your manage service provider, resides alongside your private cloud inside of your own facility. All these things need to work together and that's what makes object storage so interesting is that it is the storage type that is designed for all these things to work together. We're designed to work with a public cloud, it's not a separate thing. It's an entity that can be seamlessly integrated with cloud which makes it so fascinating for pulling all these things together. MM: And I guess that's part of the motivation for being called Cloudian, is an enterprise storage provider is you're bringing that cloud goodness back to the enterprise so they can they can integrate that. So I think we're running a little bit out of time, but if someone wants to learn a little bit more about Cloudian in particular, I know you've got a website. Is there anything they should go look for or try out in that you'd recommend? JT: Yeah. So I think you know Cloudian.com, our servers, our website obviously and I would emphasize that people should look at the different kinds of solutions that are designed to work with object storage. Think backup solutions, archiving solutions, big data solutions. There's a whole host of things out there that are just designed to work directly with us seamlessly integrate. So come to Cloudian.com, learn about some of those solutions. I think you'll find there is the use cases in there that everyone can benefit from.